September Ho Gaya…September is gone. And I didn’t even have much time to blog. I did some traveling – again to the Golden Triangle (see below) – went to a film shoot (see my last post), attended the Elle Decor India Design Awards, and also found time to check out the Ganpati Visarjan (immersion) on Chowpatty Beach. For a brief moment, totally unrelated to my Bollywood filming, I was even offered a part in an Indian soap opera! Sadly, that didn’t work out because of timing. But I’ll still keep my hat in the ring for future opportunities. All of that and work – including full-time and freelance editorial stuff – has not really allowed me to blog lately. Still, I wanted to share some stories and pictures because October will be even busier. My mom visited at the beginning of September and we had a fantastic time – trawling the fabric markets for bargains, riding elephants in Jaipur, seeing the Taj (a second time for me! ), and sweltering in the post-monsoon heat wave. I had done most of the tour before in February, but had to miss Rajasthan then. And, despite Anthony’s warnings that it was too touristy, I still enjoyed myself. 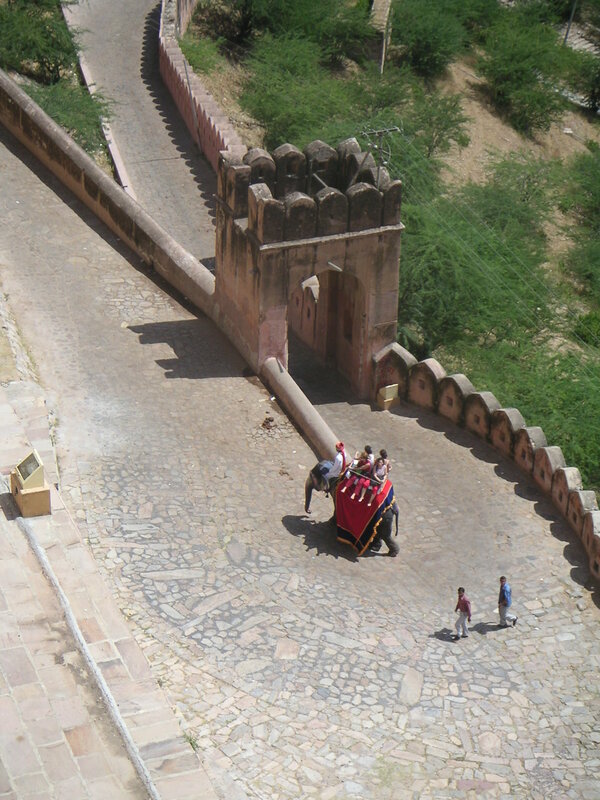 The Amber Fort, located at the top of an impossibly steep incline, was one of the highlights of Jaipur. To be frank, I don’t remember too much about the site itself – the sun was cooking my brain and my grasp of Rajput history still too poor – but I do remember our guide. Mr. Saini, a sextagenarian with a British accent who claims he learned his English from tourists, showed us the finer points of the Fort, took our photos, and acted atypical of a tourist trap guide. So, if you visit the Amber Fort and find yourself bombarded by “accredited” guides (you inevitably will be), ask for Saini. 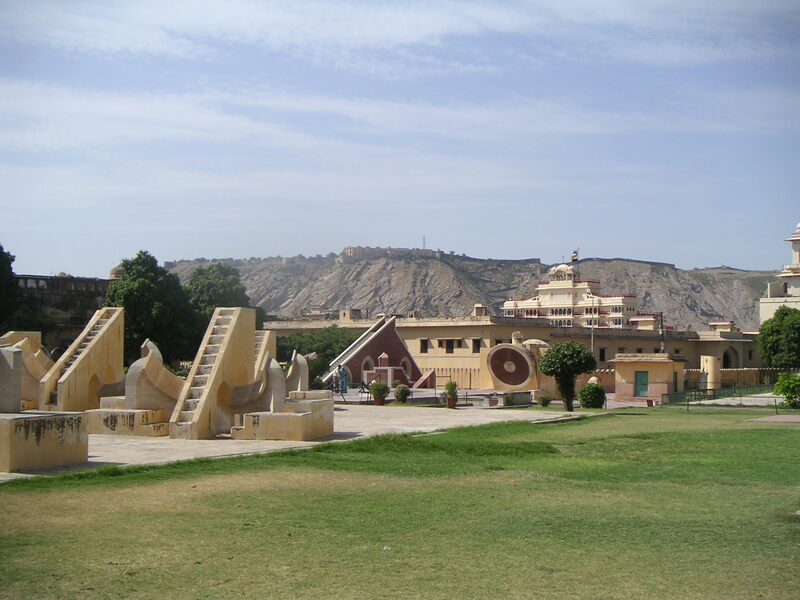 I dug the Jantar Mantar, a bizarre astronomial park constructed by Jai Singh II in the early 18th century. 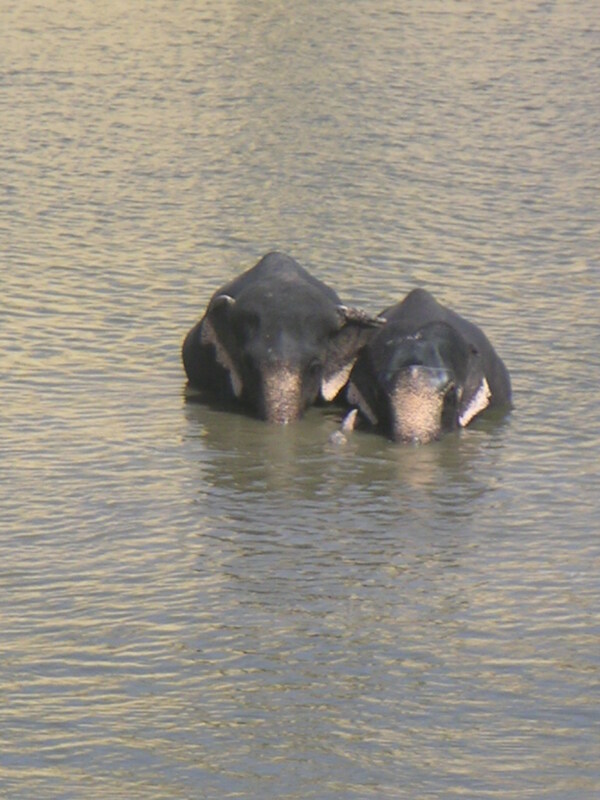 Apparently, there are several of these parks strewn around Rajasthan and Delhi, but this one is the best preserved. Sundials, gigantic star-reading instruments, and twelve identical yantras that were positioned in different ways in order to read the zodiac constellations. These and other yantras mainly consisted of steep stairways, which early observers would climb to get an accurate read of the heavens. I kept thinking this barren, bleached-out, stonescape was the perfect place for a fashion shoot, either for Vogue “resort” collections or the Sports Illustrated swimsuit issue. Again, it was impossibly hot. We also got lucky with our hotel, a $30-per-night, heritage home with a garden, a competent staff, comfortable beds, and BBC. Our trip coincided with the landfall and fallout of Hurricane Katrina, so having access to t.v. coverage was essential. The rest of the trip – to Delhi and Agra – was a bit of a whirlwind. In Delhi, we visited the Gandhi National Museum and the Raj Ghat, site of Gandhi’s funeral pyre (more on that in a later post). Agra was a daytrip. One really doesn’t need any more than a day to see the sites (Taj an Agra Fort) in Agra, so I wish that Indian rail would run more trains like the Taj Express. Though, I bet the 5-star hotel lobby in Agra helps to keep the train access at a minimum. From riding an elephant to submerging many, a week after getting back from the Golden Triangle, it was time again to celebrate Ganpati. The sights, sounds, and sheer madness of the final day of Ganesh Chathurthi is too impossible to capture on film (at least by an amateur like me) and equally hard to describe. This year, we went a bit too late down to Chowpatty Beach, so we missed the sunset and some big immersions. We also came down from our perch to mingle with the crowd, but that was a big mistake. There’s something about being in the middle of a crowd of 3 million+ (and mostly men) that just leaves me uneasy. I took a few snaps and got the hell out. Luckily, when we had come back to the neighborhood, we got to see some other Ganpatis on their way from the suburbs to Chowpatty. Traffic was thick with Mardi Gras-like “floats” packed with giddy, dancing men and Plaster of Paris idols. 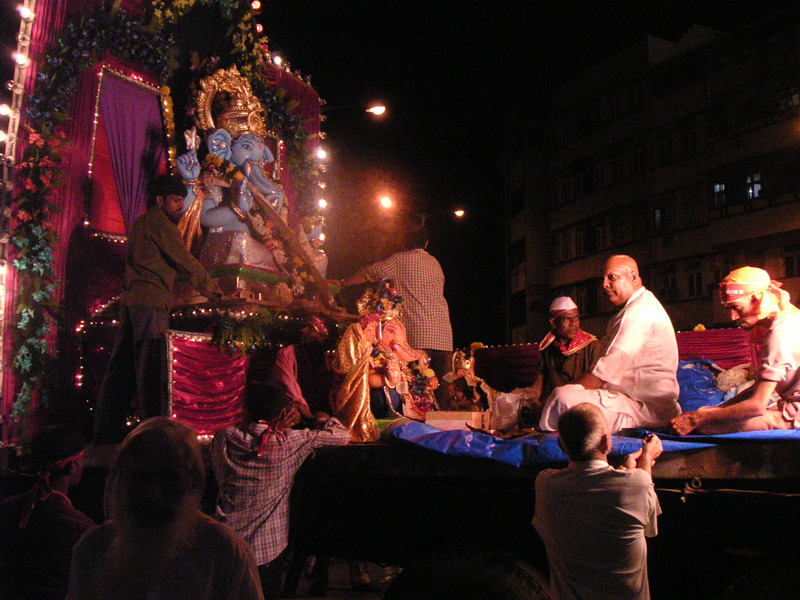 The idol on the flatbed in the photo above was most likely from a poorer neighborhood to the north of the city but it came equipped with its own sound system and generator truck. 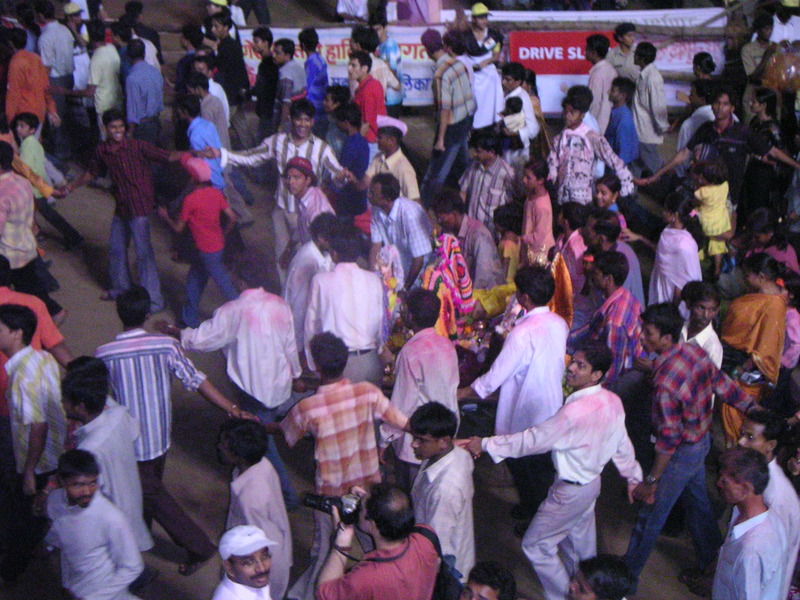 Ganpati is Bombay’s holiday, and it really is the best, if not the loudest, time to be here. This is Mahesh, I am originally from Mumbai but now in Dallas, TX. 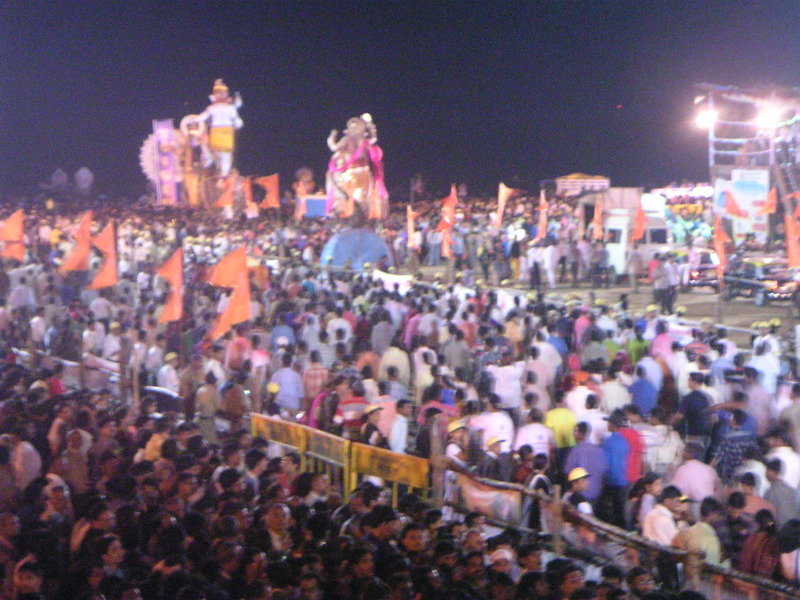 I was glad to find out that you were able to witness the Ganesh Festival there. Here I am missing it every year.